OBAD members pose for a group photo Saturday at Rocky Fork Lake. Pictured back row (l-r): Ryan Sapp, Mike Hall, Larry Moore, Elijah Williams and David Mitchell. Front row(l-r): Joey Duffey, Bryan MacFarlane, Todd Krajewski, Carey Dalton and Micah Lipps. 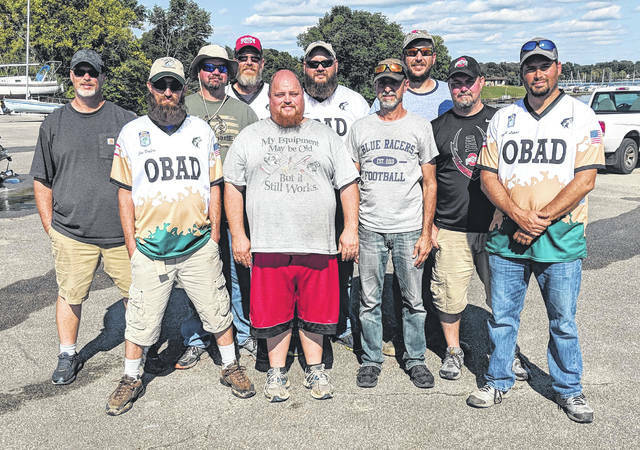 The Ohio Bass Anglers of the Deaf, or OBAD, held their final bass tournament of the season on Saturday at Rocky Fork Lake. OBAD president Elijah Williams was the winner on Saturday as he reeled in two bass totaling 3.45 pounds. Second place in the event was claimed by Hillsboro native David Mitchell who caught one fish in the tournament, the fish weighed 2.30 pounds which was enough to claim the prize for largest fish caught at the tournament. Todd Krajewski took third place as he caught one fish on the day that weighed in at 1.70 pounds. Washington Court House resident Joey Duffey caught two bass on Saturday and just missed beating out Krajewski with a total weight of 1.68 pounds. Mike Hall, a resident of Lynchburg, had the final fish of the day and it weighed in at .84 pounds. There were a total of 10 OBAD anglers in the tournament at Rocky Fork Lake including Micah Lipps. Ryan Sapp, Larry Moore, Bryan MacFarlane and Carey Dalton. OBAD was founded in 2003 by David Woodward and Woodward served as president of the organization from 2003 until 2013. The organization stages six tournaments every year between April and September, all tournaments are scheduled for the fourth Saturday of the month with the exception of May which is held on the third Saturday. Today the organization boasts 12 members from across the state of Ohio. The largest turnout for a tournament in 2018 was May 12 at Alum Creek Lake in Delaware County where there were 13 registered anglers and on seven boats. OBAD member Rick Owens is currently sitting atop the Angler of the Year standings with a total weight of 13.50 pounds and Micah Lipps is in second with 8.43 total pounds on the year. Altogether in 2018 anglers with OBAD have combined to catch 30 bass totaling 50.49 pounds across six different lakes in Ohio. Seven year OBAD member Joey Duffey had this to say when asked about his reason for joining the organization. “I like to challenge with other good and great deaf anglers out there in Ohio. I been a member OBAD since 2011 and I enjoy challenging with other deaf fishermen. I also really enjoy the challenge of going to different lakes that I have never been to before. It has been up and down all these years but it been fun for me to see other deaf anglers catch nice bass with big smiles on their face,” Duffey said. If you are someone you know would be interested in joining the Ohio Bass Anglers of the Deaf you can contact OBAD President Elijah Williams via email at elijahworange@gmail.com. OBAD will accept people who are deaf, hard of hearing, child of a deaf adult (CODA), or anyone fluent in ASL.